The quaint little town of Bharmour is held in high regard for it is the pious earth of this place that houses the Chaurasi Temple. It is, in fact, a complex housing many temples with the Lakshmi Devi, Ganesh, Manimahesh and Narasimha being the main ones. It is around these temples that the activities, culture and customs of the people of the area revolve. The splendid mountains all around embrace it in their folds and add majesty to an already devout atmosphere. It is also known as the Chaurasi Khamba for the exquisite 84 pillars that form a part of the temple complex. Ring the bells that resonate through tranquillity with NamasteIndiaTrip. The story goes back many hundred years when the place was known as Brahmpura and the Goddess Brahmani Devi lived here. Once when she was away for a while, Shiva came here with 84 Yogis or Siddhas (Saints) on his way to Manimahesh Kailash. Seeing the smoke billowing from the fires lit by the saints, Brahmani Devi, on here return, got very furious and asked them to leave. Shiva asked to be allowed to stay for a night and assured that they would leave in the morning. The next day, Shiva left Kailash alone, leaving the saints there. Unwilling to leave the place, they transformed themselves into 84 Shivlings. Brahmani Devi was blessed by Shiva and he ruled that everyone undertaking the Kailash pilgrimage must take a dip in the holy Brahmani Pool before continuing their journey or else, their pilgrimage would be fruitless. Brahmani pool is below the Brahmani Cave and it is said that she stole the water from Sandholi Naag on the other side of the ridge for this pool. The legend regarding how she came to be a goddess is equally interesting. It is said that Brahmani lived in a Vatika on tall ridge and her son was very fond of a Chitkor (a kind of bird). The Chitkor was killed by a farmer and her son could not bear the loss and died. Heart-broken she buried herself alive and the spirits of al three of them started haunting the locals. Another fable regarding the temple is that of King Sahil Varman who ruled during the tenth century. 84 Saints came to his kingdom and pleased by his welcome and hospitality, granted him the boon of ten sons and a daughter. The town of Chamba is said to have been named so after his daughter. The town of Chamba is said to have been named so after his daughter, Champavati. The temple also holds importance for being the abode of the Pandavas during their 14 years of exile. A Ganesha temple stands near the entrance of the complex. The tallest temple in that of Manimahesh and has been built in the Shikhara style. The most ornate and based on the old wooden style temples is the Lakshana Devi Temple. The best time to take a trip to Chaurasi Temple is from May to November as it gets bitterly cold and snowed-in during winters. 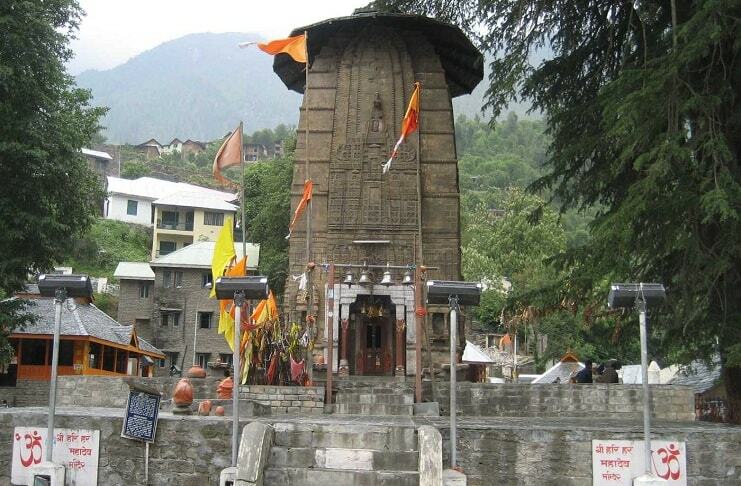 Devotees visit it during their trip to Manimahesh Kailash and the pilgrimage takes place during this period. There is no dearth of places to stay in Bharmour and reaching the temple is also relatively easy, given that the place is well connected 65 km from Chamba, there are many special buses that ply on this route. It is well connected by railways also, with the nearest broad gauge and narrow gauge stations at Pathankot and Kangra respectively. When so many Gods dwell together, it becomes all the more compelling to pay a visit and cast away all sins. The temples at Lakshana Devi and Ganesha are the oldest in the complex. There is a spellbinding brass idol of Lakshana Devi in her Mahishasura Mardini avatar. The water of Ardh-Ganga or Gupt Ganga, a water source in a corner of the complex has religious significance. Bharmour is also referred to as Shiv Bhoomi.